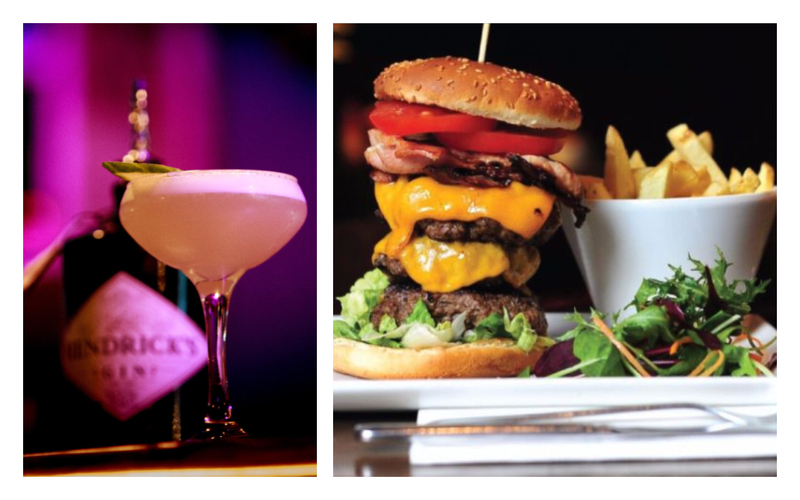 Galway is lucky to have lots of great restaurants putting their own spin on one of our favourite foods: the burger. 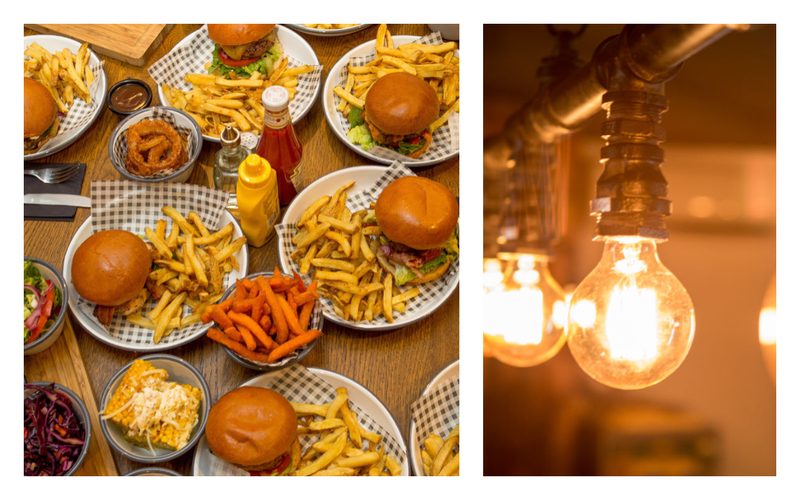 Take a look at some of the best spots to check out when you’re craving a burger and chips! 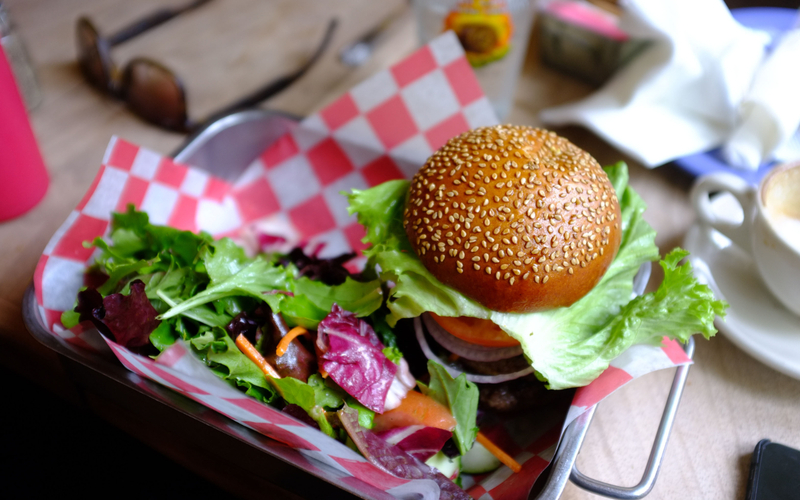 And if you want to get your veggie burger fix, no worries: we have an article for that, too. This funky restaurant is dedicated to locally-sourced and homemade everything, from the homemade brioche buns and house-made sauces to the locally-sourced beef and Irish cheeses. 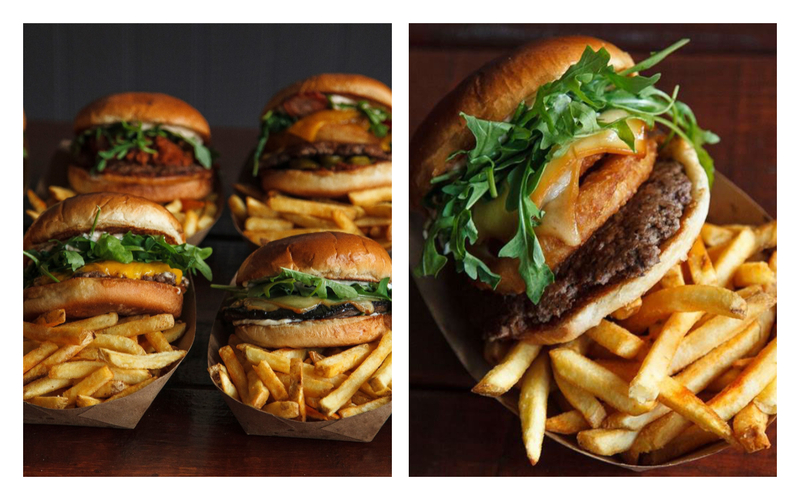 Their menu is small but mighty, with a choice of five burgers including a veggie burger. Their burgers are gluten-free and they have buns to match, too, so just ask! 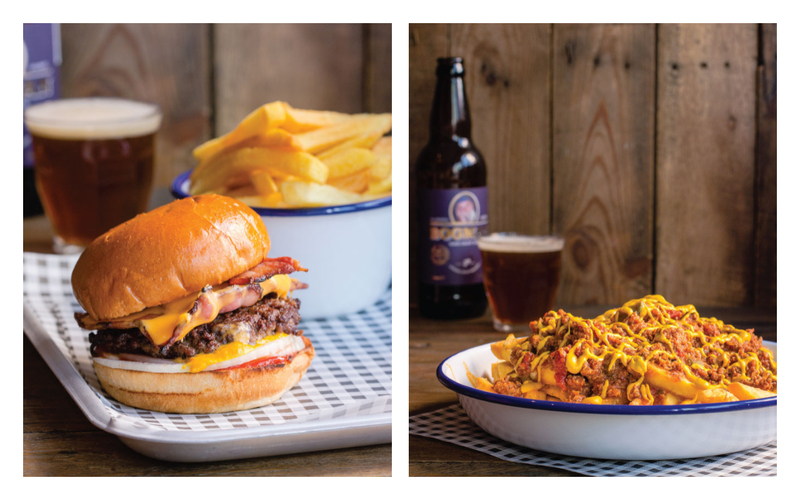 BóTOWN serve up a classy and delicious feast of burgers and craft beer throughout the day and night. 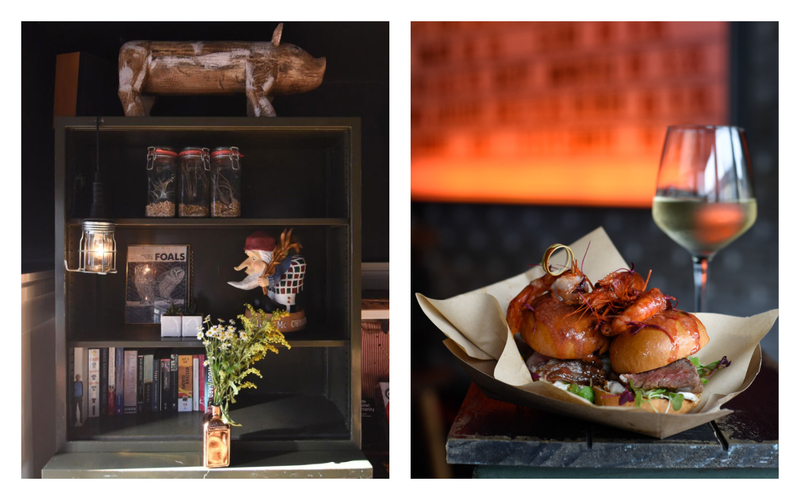 They do takeaway, but we highly recommend sitting down in their warm and welcoming restaurant with a pint from their carefully selected craft beer menu. 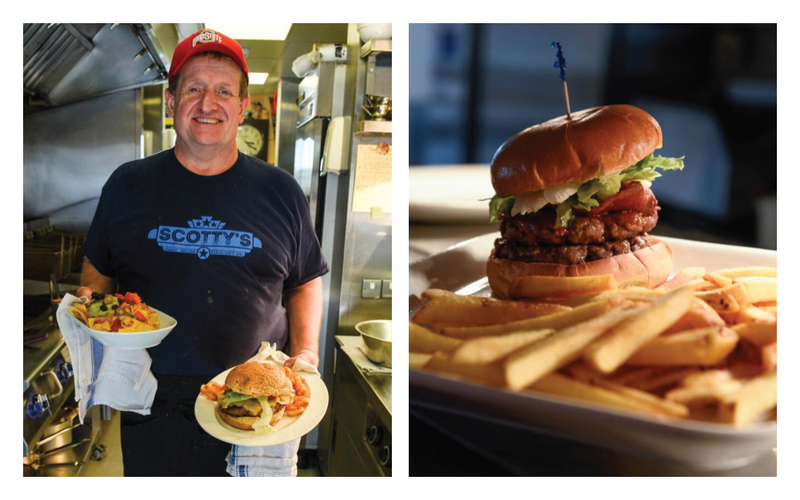 They serve up all kinds of burgers, from your standards to fish, veggie and chicken. Their special, ‘The Tribesmen’ is made with Connemara Irish steak, Gouda cheese from Portumna, and Galway Bay IPA battered onion rings, plus a maroon and white slaw for good Galway feeling. 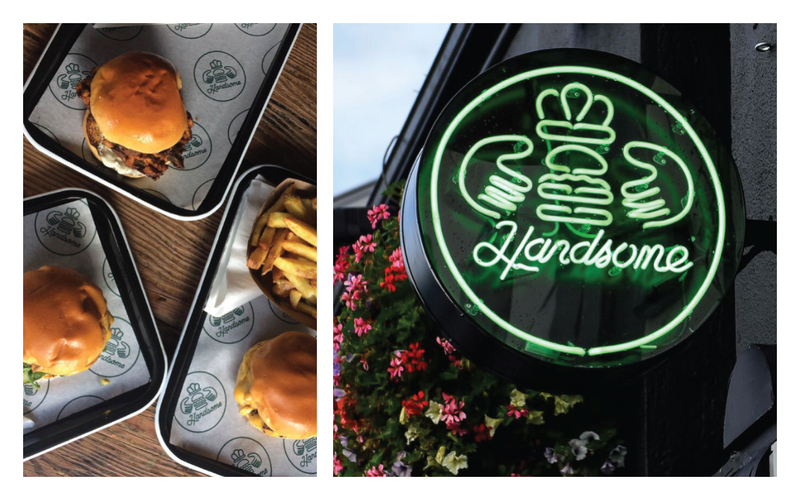 Like a lot of Galway’s favourite eateries, the Handsome lads started things with a pop-up burger stall. They’re in the process of opening their own restaurant, where you can order your fill of gourmet dressed-up chips and locally-sourced, delicious burgers. On top of the usual options, their buffalo chicken burger and the ‘Petey Pablo’ with chorizo and chunky guacamole keep things interesting. And their halloumi fries are 100% necessary. This American-style family owned diner has possibly the best and most expansive menu around. They serve over 58 burger combinations, from spicy Mexican-style burgers to barbecue chicken and pretty much anything else you could imagine. They also have a very tempting selection of milkshakes, chicken wings, chili and nachos, so if you’re looking to bust some buttons, this is the place. Massimo serve up four delicious burgers including a vegetarian halloumi burger, a buttermilk fried chicken burger and a pulled ham hock burger with black pudding. It’s a little bit different and very delicious. Every burger comes with crispy chips on a Waterford blaa. And don’t forget the cocktails — they’re essential to burger-eating at Massimo. If you’re feeling brave, go for the Beast Burger: s a delicious beef burger with tomato and chili relish, rocket, chipotle mayo, cheese, jalapeño chilies, smoked bacon and onion rings… Add some paprika fries in there and you won’t move for days. This is gourmet American-style diner food. It’s a unique option for some high-quality versions of your favourites. They use a pressure-cooker for their deep-fried chicken and fries, so they’re extra-crispy without being greasy. You might have to unhinge your jaw to get your mouth around their triple-stack burger but it’ll be worth it. Round out the meal with a boozy milkshake and it’s a meal to remember. This sprawling bar also has a delicious food menu and of course we’re talking about their burgers. 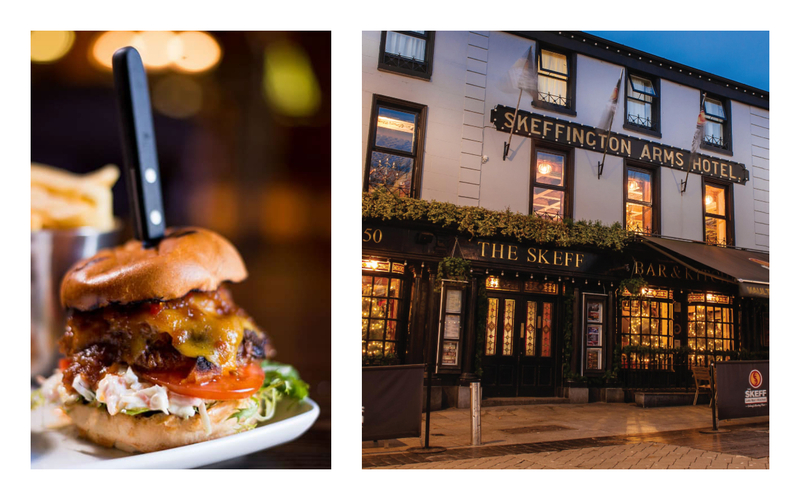 The Skeff beef burger is served with coleslaw, homemade chilli jam and chips, and the peppered beef burger comes with mash, onion rings and pepper sauce like your favourite steak meal but in burger form. 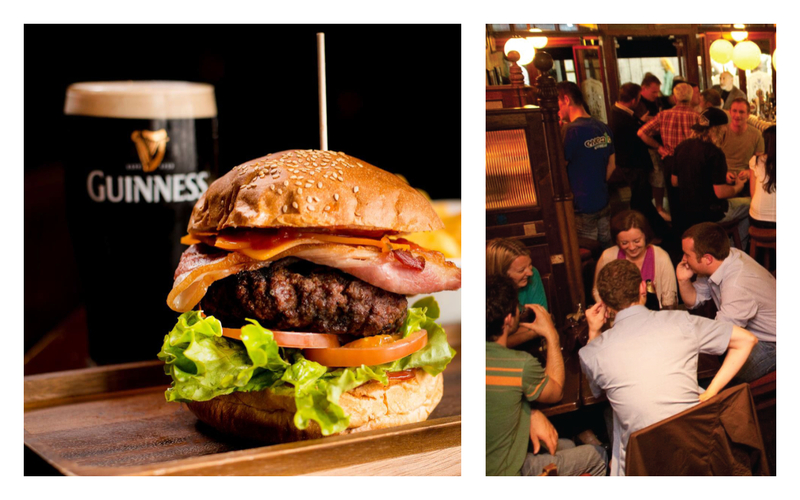 On Tuesdays you can grab a burger, chips and a pint for €15! Caribou have just rolled out their own menu of propery durty pub food, perfect for sharing with friends and a pint in hand. 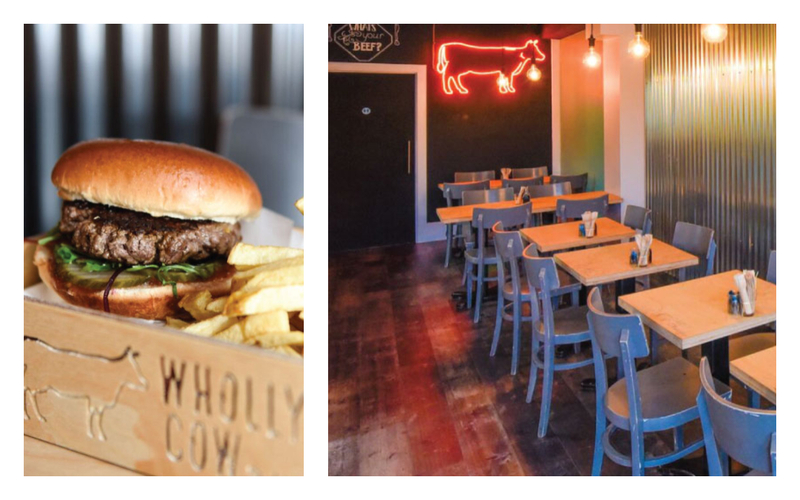 Burger options include their fried chicken thigh burger, spiced with lemon pepper and served with mango chili mayo, and their surf’n’turf sliders made with Sheelin’s fillet beef and topped with Gannet’s crimson shrimp! Don’t miss the jammy chips, loaded with Herterich’s bacon-sausage-onion jam and tons of parmesan cheese. Their crispy fish burger, slathered with homemade tartar sauce and stuffed with a crunchy slaw tastes like summer all year round and comes with skinny fries. They use only the best of freshly-caught fish from Ali’s Fish Monger right down the road. 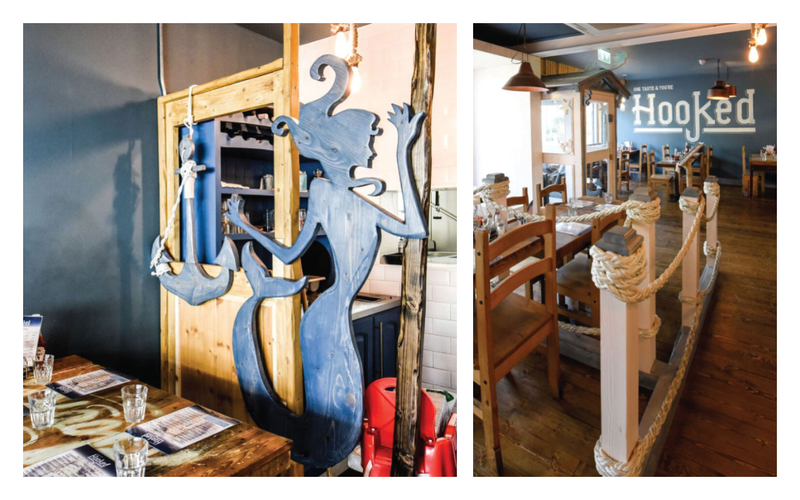 Enjoy in their cosy, nautically-inspired restaurant, or take it to go! Not for the faint of heart, the burgers at Capone’s aren’t here to mess around. Stacked miles high, these towering masterpieces are juicy and delicious and enormous. And you can trade for a spelt bap or a gluten free bun if you like. They’ve also been revamped the space into a very trendy cocktail bar, so plan on staying a while! 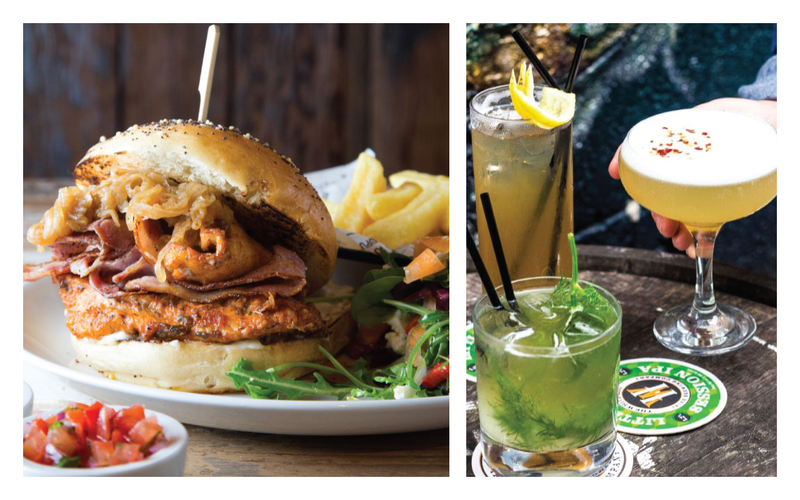 When it’s match day, the Dáil Bar is the place to go for big screens, cold pints and one of the best burgers around: the McGeough’s Steak Burger. It’s made with 100% Connemara Irish steak and smoked bacon with chips. Pair it with a Guinness and you’ve got a great time. If you fancy something a bit stronger, head upstairs to the Liquor Lounge! Lunch Time in Liosban also do a killer burger!